This season has been really strange. It has only snowed once so far, and it melted in the blink of an eye. It feels like a Texas winter. It's been raining much more than it's been snowing. Usually the snowy season begins before Halloween! Despite the strange weather, I still crave hot chocolate quite often. One thing that's kind of weird about is me is that I don't like regular marshmallows. I like the tiny marshmallows that come in the packet of hot chocolate (I know, I know). I also like homemade marshmallows. There was a magic grocery store called Central Market near my house growing up. I used to love to sample the homemade marshmallows. I've always wanted to try to make them. Last night, as I was avoiding anything resembling studying for finals, I decided to make some homemade marshmallows. I'm seriously impressed with how easy these are! Next time, I'd love to experiment with adding peppermint flavoring instead of the vanilla or adding some melted chocolate chips during the whipping. Yum! 1. Put 1/2 cup of the water into the bottom of a stand mixer fitted with a whisk attachment. Add the packets of gelatin and give it a quick stir. 2. Combine remaining water, sugar, corn syrup, and salt into a small sauce pan over medium-high heat. Cover and cook for 4 minutes. 3. Uncover the pan and clip a candy thermometer to the side of the pan. Keep cooking until it reaches 240 degrees fahrenheit. It took me about 8-10 minutes. Once it reaches 240 degrees, immediately remove the pan from heat. 4. With the mixer on a low speed, slowly poor the sugar mixture into the gelatin mixture in the mixer. Once it's all in the mixer, turn the mixer on high speed for 15 minutes, or until the mixture looks like marshmallow creme: white, fluffy, and lukewarm. Add vanilla during the last minute of mixing. 5. Mix the powdered sugar and cornstarch together in a bowl. Lightly spray with cooking spray a 9x13 pan (after you spray, it would be good to use a paper towel to remove the excess spray from the pan. You just want a very light layer or it will color the marshmallows yellow!) then dust the pan with the sugar/cornstarch. 6. Spread the marshmallow in the pan to be as even as you can. Then, dust the top with powdered sugar/cornstarch. After you do this, you can pat it more evenly with your hands. 7. Leave it, uncovered, for at least 4 hours. I left mine overnight. 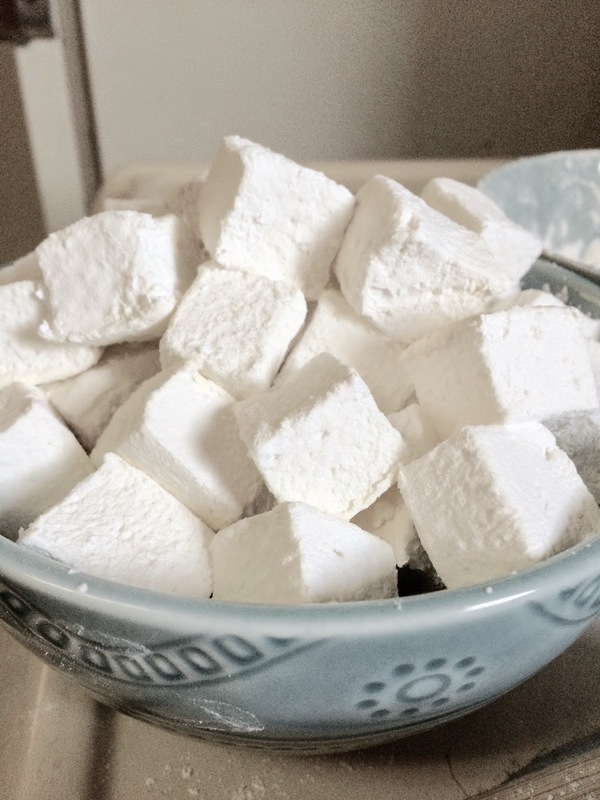 Afterward, cut the marshmallows into cubes. Toss them with powdered sugar/cornstarch to prevent them from getting too sticky. Store them in an airtight container for up to 1 month!